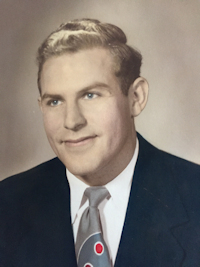 Obituary – Jones, Cumby “Jack” « Perry High School Alumni Association, Inc.
Cumby “Jack” Jones, 87, father, teacher, and coach passed away peacefully on July 27, 2012. Jack was born on April 4, 1925, in Three Sands, OK, to John and Lodusky Jones. He spent his first 18 years, in Perry, OK. At Perry High School, he participated in baseball, basketball, wrestling, and football. His football coach was Gene Boyett, former coach at Desert High School (on Edwards Air Force Base, CA). Ironically, Desert was to be Jack’s final teaching and coaching job. He held down a full-time job, at Forney’ s Dairy, milking and delivering the products, to their store. He received a “Perfect Attendance” certificate from the then-Governor of OK, for his 12 years of schooling. So, early on, Jack “took a keen interest to the school atmosphere.” He made it a priority, to attend Perry High’s Reunions to coincide with “Cherokee Strip Days”, held each September. After his high school graduation, in June 1943, he joined the Army. He was a Sergeant of “B” Battery of the 87th Armored Field Artillery Battalion (the Jeopard). He commanded a 7-men crew on a 105—mm Howitzer, mounted on a tank. He served in the European Theater, landing three days after D-Day, in Normandy, France. He was wounded, in 1944, and loved telling stories of “catching military hops” to European cities, while recovering in London. His unit participated in the “Battle of the Bulge” campaign. For his service, he received a Purple Heart, EAME Theater Ribbon and one Silver Service Star. He had attended numerous 87th Reunions, held at various locations, in past years. After the war, Jack returned to Northern Oklahoma Junior College at Tonkawa, OK. He transferred to Panhandle A & M, at Goodwell, OK, where he graduated with a Bachelor of Science Degree, in 1950. During his senior year, he met and married Dorothy Ballenger, with whom he shared 33 years of marriage and six children. After brief move to California, in 1951, he and his family (adding first daughter) returned to OK. He received his OK teaching certification in 1952 and began teaching, coaching and officiating in Guymon and Alva, OK, where two more daughters joined the family. Upon settling in Farry, OK, he taught history as one of three teachers on staff. 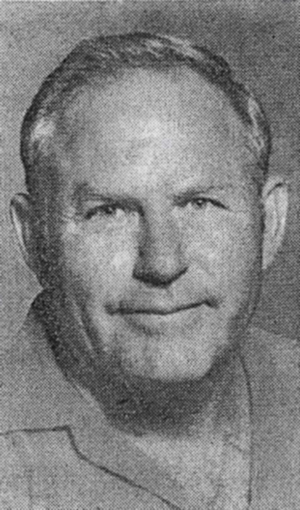 He coached football, girls’ basketball teams, and drove the high school’s bus. The stories from his former Farry students include memories of the winter bus rides, opening of the doors, and being met with the “aroma” of a diaper pail. The girls’ basketball team duties for the day included washing, and folding them for the return trip. A few Farry students helped the family move to Pittsburg, KS, in the summer of 1955, looking like the “Beverly Hillbillies.” A highlight of his Pittsburg High School year was the field trip, to Chicago, IL. They attended a Cubs baseball 3-game series. It was a first big-city visit for many of them. Each night, the high school team was announced, and they took a bow, from the stands. The final lure of CA came calling that summer, in 1956. He had traveled to CA periodically to work in construction along side of his father. He gained his General Secondary credential, at California State University (Fresno State), in Fresno, CA, that summer. His first teaching job was, in the fall of 1956, at ﻿Kern Valley High School, in Kernville, CA. In 1958, the family moved to Palmdale, CA, where a son and two more daughters were born. While he taught at Palmdale High School for three years, he coached various sports, including football with his life-long friend, Martin (Marty) Soliah. It was Marty, who talked him into moving to Foxholm Drive, (where he resided for about 40 years.) From there, it was on to (John) Munz Camp (a Los Angeles Co. juvenile probation camp), in Lake Hughes, CA, for two years. Finally, in 1964, he arrived at Desert High School, on Edwards Air Force Base, CA. He became one of the Antelope Valley’s first daily commuters, (just heading north, instead of south to LA, traveling about 100 miles) round trip. His main teaching position was Physical Education, but other subjects included history, math and freshman orientation. Coach Jones had the football, track, and golf teams throughout his DHS career. He eventually settled in with his golf teams, as his passion, with the game became an obsession. Desert’s golf team won numerous titles, in the High Desert Sports Golden League. Speaking of the Hi Desert, Jack was a charter member of the Lancaster Chapter of the Mojave Desert Officials Association. His duties had him traveling all over the desert, officiating all sports. A highlight of his officiating career was, in 1969, when he was elected it’s Commissioner. He retired from Desert in 1993. Jack tried substituting a few years, but enjoyed being retired. He bought a home, in Palmdale, CA, settled into playing more golf, at Desert Aire Golf Course, Antelope Valley Country Club and Camelot, in Mojave, CA. He traveled and played over the years, to many famous golf courses, including one of his favorites, Pebble Beach. His six children, five daughters and son survive him. Katherine, Glenna, Jackie, Casey. (Cumby Jr), Louise, and Nancy. He has twelve grandchildren and four great-grandchildren. He was preceded, in death, by his brother, Glenn, his infant grandson William Osborn, and ex-wife Dorothy Jones. A memorial service was held on August 20, 2012, in the Palmdale High School Gym. Interment and gravesite services will take place on October 12, 2012, at the Grace Hill Cemetery Pavilion, in Perry, OK, at 11 am. In lieu of flowers, a golf scholarship will be awarded, each school year, in his honor, at Desert High School. Your donations can be sent to: Desert High School, do Coach Jack Jones Memorial Scholarship, 1575 Payne Ave., Edwards, CA 93523.